The Spark is currently based at the library with our Imaginative Neighbourhoods project, and with artists in residence Parmjit Sagoo and Dave "Stickman" Higgins. Limited spaces on Cossington Street. 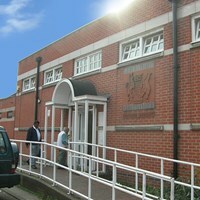 Belgrave library is accessible to wheelchair users with a ramp to the building and a wide entrance. Disabled car parking also available outside.